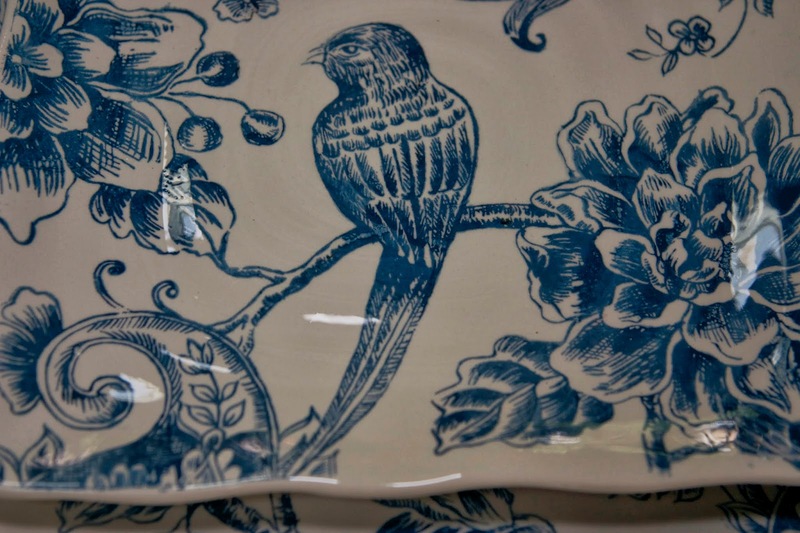 A few months ago while in HomeGoods, I spotted some blue and white dishes that really attracted my eye. There was only one issue: they were square in shape. I am a real traditionalist and didn't have any square plates in my tablescaping stash. I started looking at this relatively "new" trend ( to MY way of thinking!) when my daughter got married in 2012 and chose square plates etched in platinum for her china. I loved her plates, but just hadn't embraced the look. So, I passed the dishes by. Well, fastforward to a couple of weeks ago when while I was back at HG (gee-----I guess I go there alot! 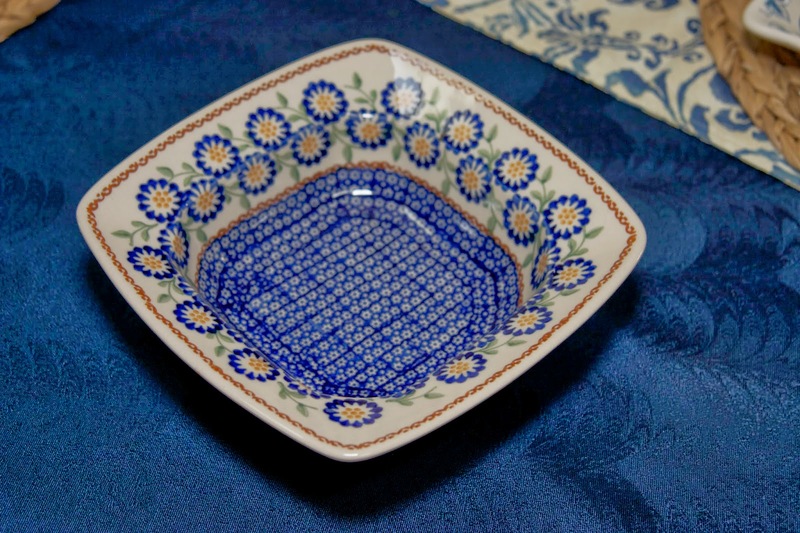 ), I noticed the same blue and white dishes in the clearance section for only $3.00 each!! How could I resist them?! So----I took a leap! I now have some square plates of my own. And I love them. I thought I'd celebrate spring with my new additions. I also realized this might be a perfect table for Cuisine Kathleen's Bird, Nest and Egg Challenge! 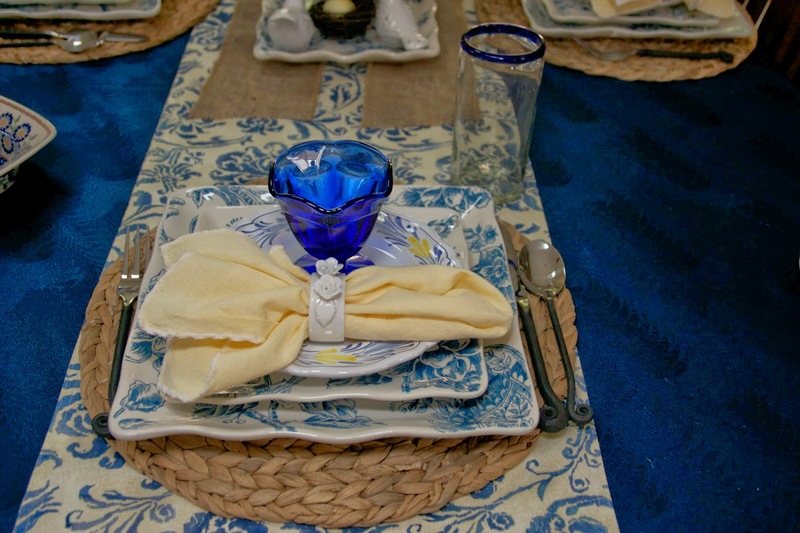 I started with my blue tablecloth from a vendor at the Orange County Fairgrounds. It is spill resistant and never needs serious ironing. My stepdaughter got me this Ralph Lauren table runner for Christmas. Don't you just love it? I do believe it inspired me to make the final decision about my new plates; the color is perfect. Since this is a spring tablescape, and the birds are building nests all around (I've been watching a particularly ambitious small brown bird using snippets of material from my hanging flower baskets outside of my back French doors each morning!) I decided my new straw placemats from Kohl's reminded me of potential nest building material! 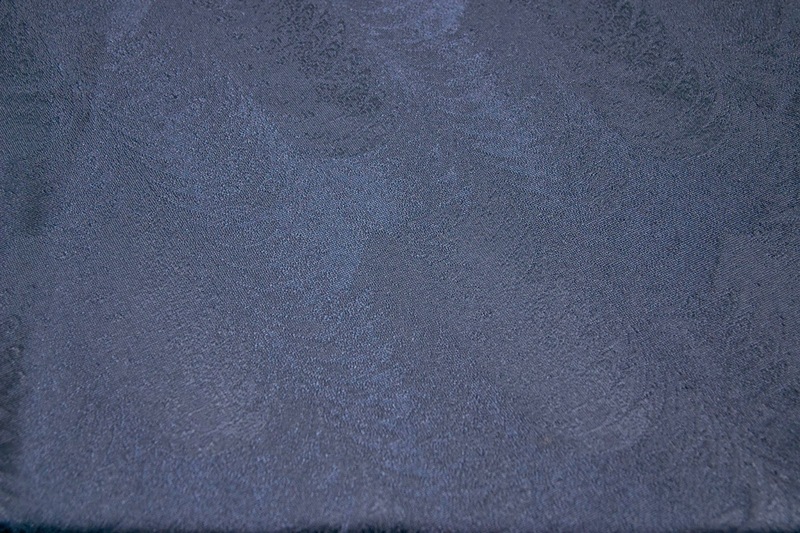 Here is the dinner plate to my new square plate set. 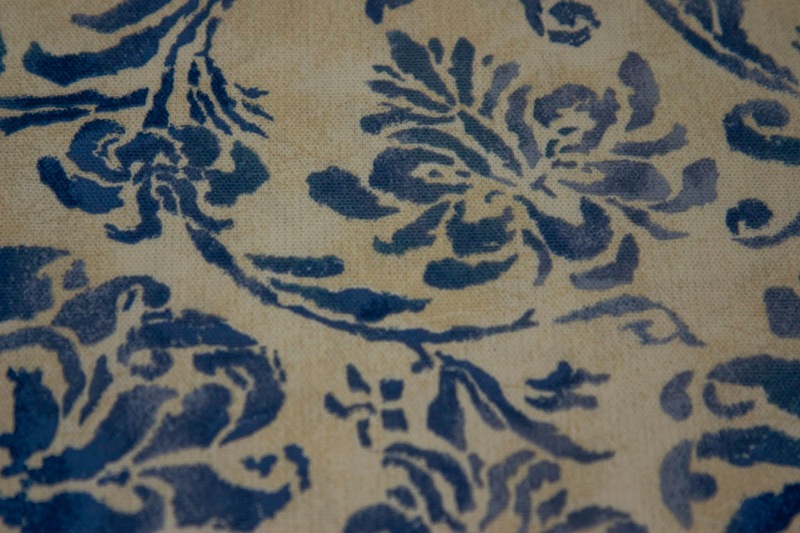 It is marked CHinoiserie Toile; designed by Maxcara. I LOVE the colors and pattern. And the little bird adds a touch of Happy Spring to the table. 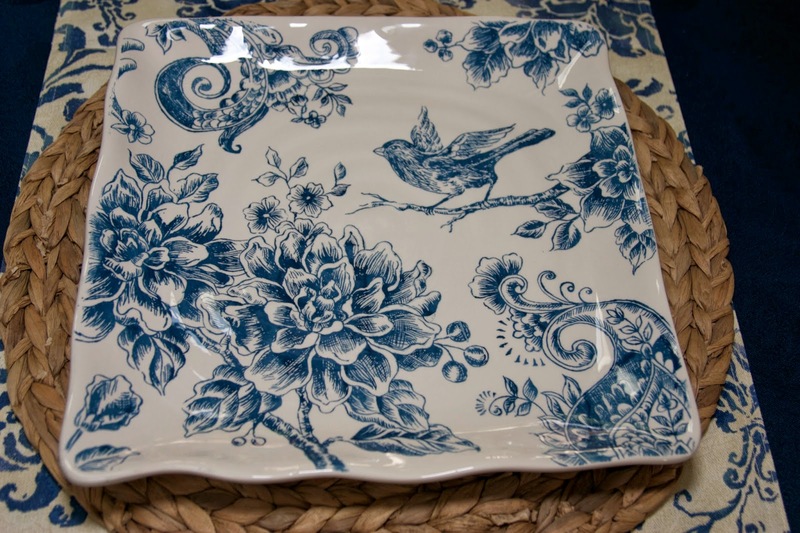 Here is the square salad plate with another pattern and a small bird just patiently waiting to begin nest building! The next layer in the dish stack is a plate I found at the Swap Meet. 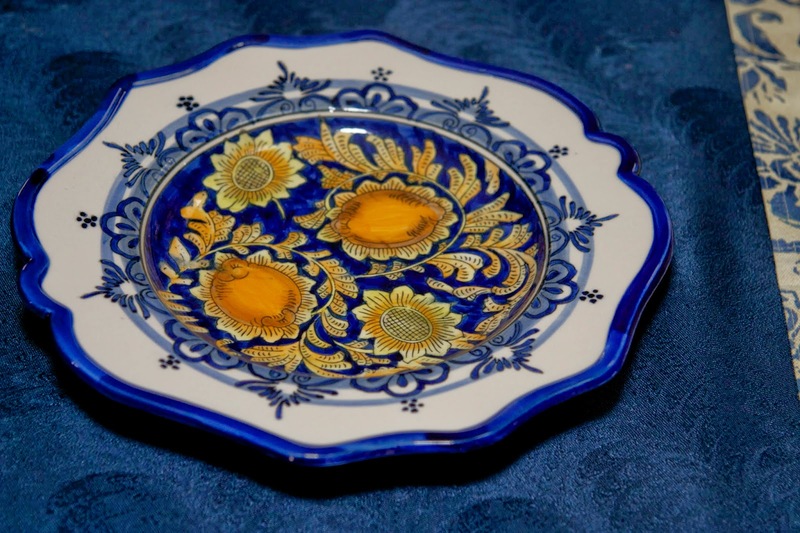 It is labeled only "Made in Italy", and I have been waiting to find the right tablescape to share it with you! I love its scalloped shape and delicate painted design. 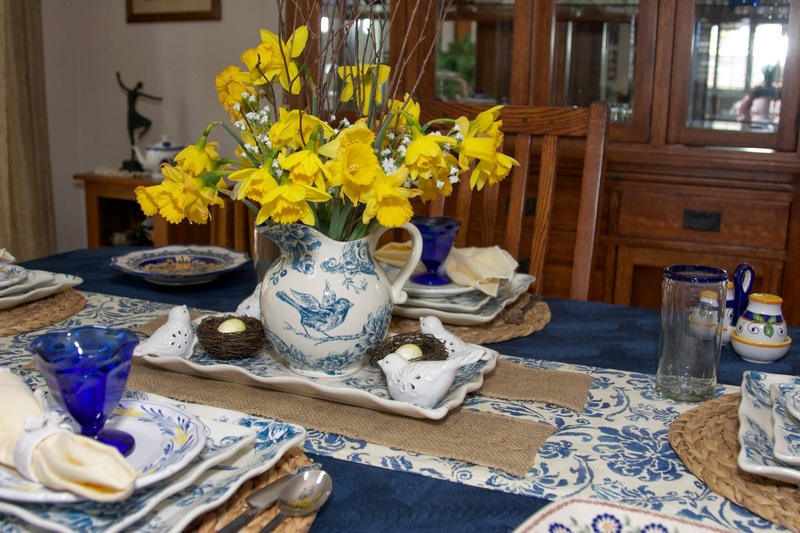 And since I knew I'd be using daffodils in the centerpiece, the choice of a dish with blue AND yellow seemed a perfect fit! 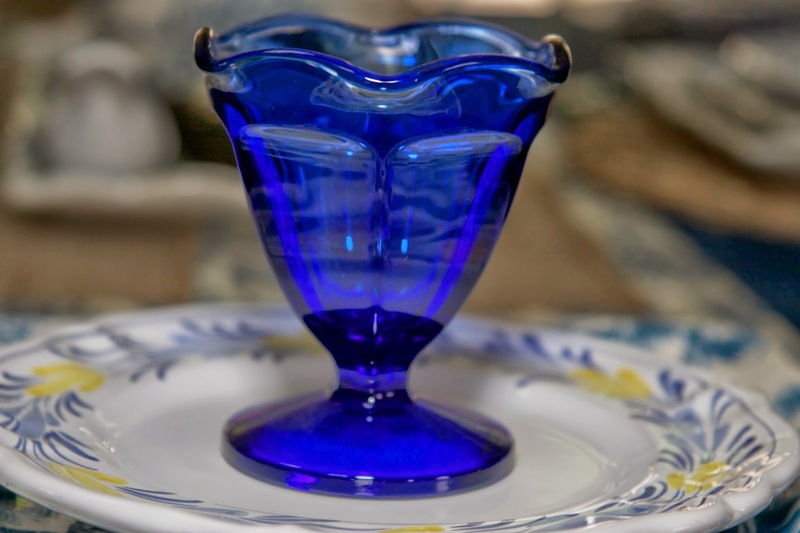 To top the dish stack off, I chose my blue glass sherbet dishes found while antiquing. 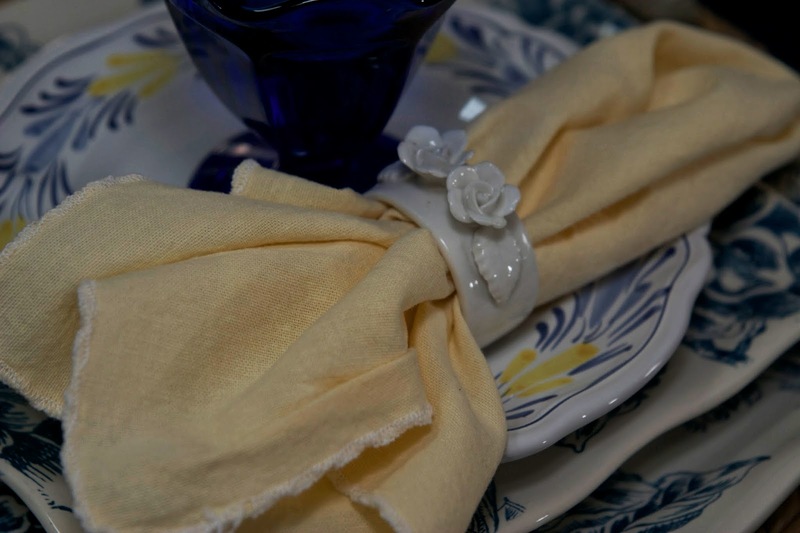 The place setting is completed with yellow linen napkins from my in-laws' trip to Majorca, and white porcelain napkin rings from an antique store (roses are always part of spring!) I used my Trebleclef flatware from World Market, because their shape somewhat resembles the twigs my little bird friends have been hoisting to their nests! I also added my Mexican glass tumblers, a gift from my daughter at Christmas. The centerpiece was created from a platter and pitcher that were also on clearance where my square plates were! There was no way I could leave without them. The daffodils were part of the decorations for my daughter's baby shower her sister and I put on this past weekend. 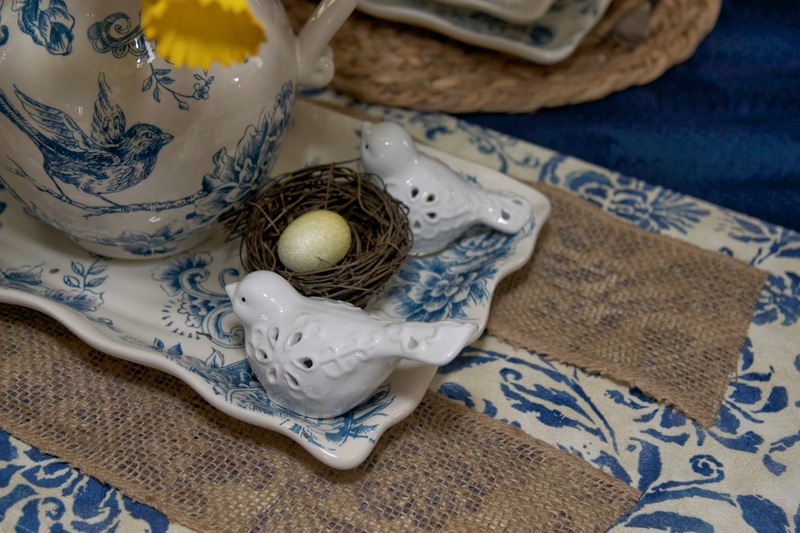 I found the birds at Michael's, and their "nests and eggs" were generously loaned to me by my dear friend. I wanted to separate the patterns a bit, so I added two small runners of burlap ribbon. Since I was enjoying the look of blue, white and yellow together, I shopped the house and added some accent pieces to the table. I've had this plate so long I can't remember where I found it, but it is labeled I. Godinger & Co. It normally is displayed on my sideboard. 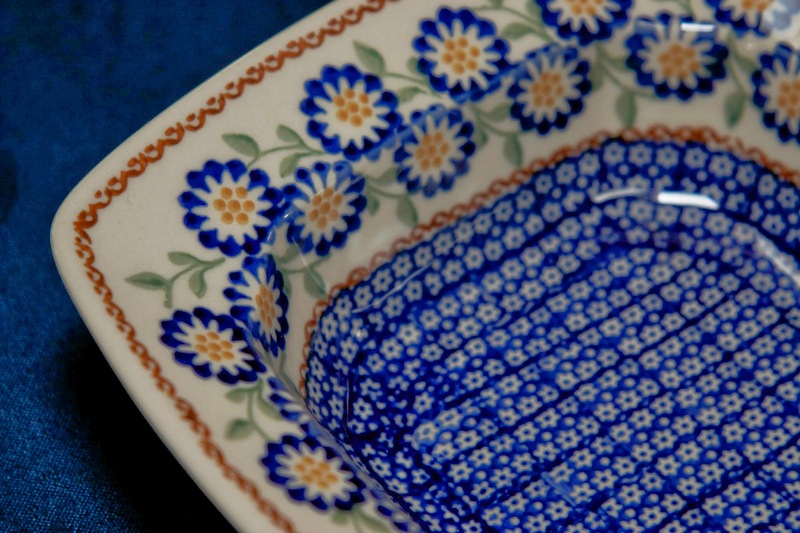 I couldn't resist this addition to my Polish Pottery collection that I found at TJ Maxx. 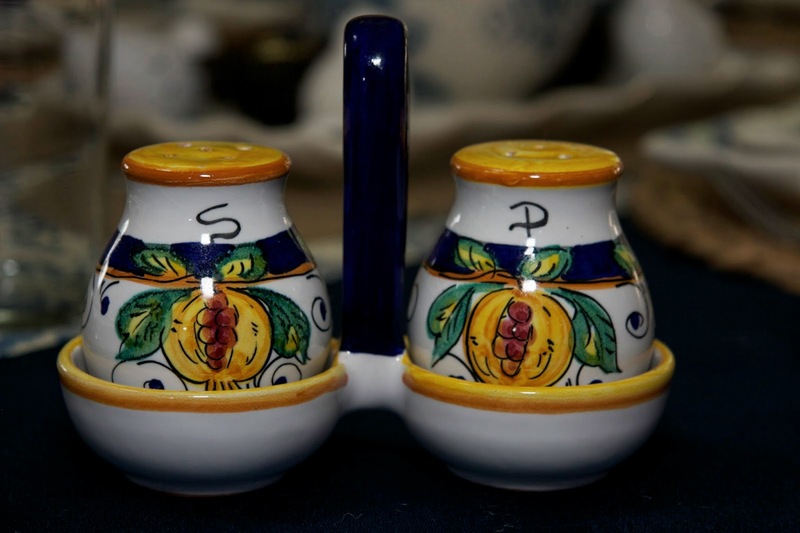 And, lastly, these favorite salt and pepper shakers came from an Italian Pottery Outlet I always make a stop at when I am in Santa Barbara. I don't think I have ever gotten out of there empty-handed! and www.betweennapsontheporch.net for Susan's Tablescape Thursday. Thank you, ladies, for hosting these parties! If you would like to follow The Magic Hutch, just go to the top of my blog, find "Follow by Email", add your email address and hit "Submit". I love to read your comments. They are always an encouragement and always appreciated. Gorgeous, Rosie! I can see why you couldn't resist those dishes -- a lovely pattern! 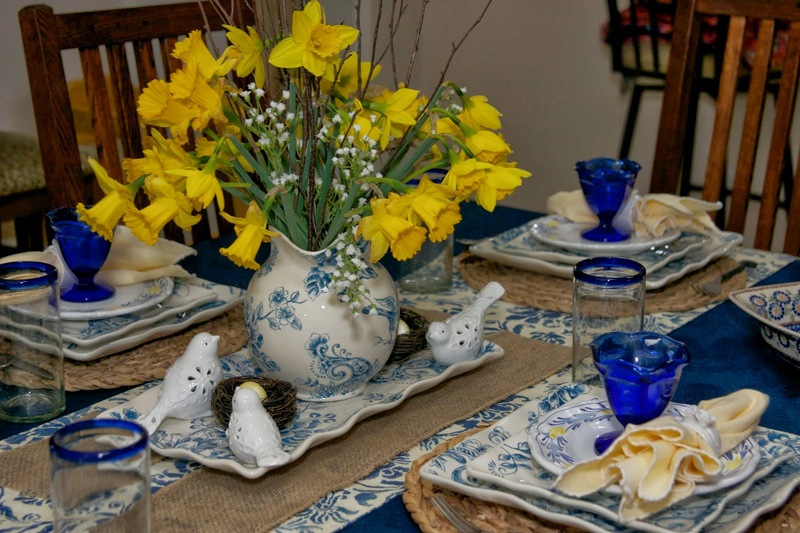 Your whole table spells SPRING, and I also love the deep blue sherbet dishes. Love this table and those dishes......to die for!!! Very pretty dishes! 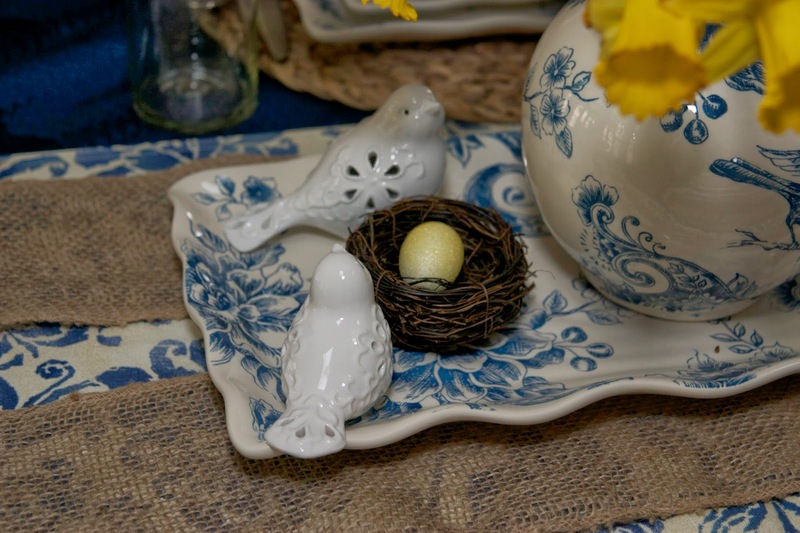 I like the nesting area you created with the centerpiece tray, pitcher and birds with nests! That was quite a nice collection of dishes you got on clearance! Your timing must have been perfect. I'd say it was meant to be! 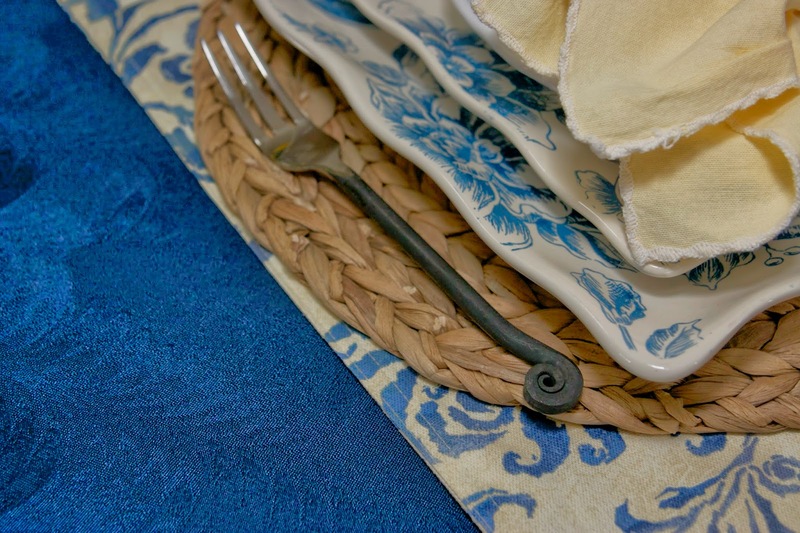 The RL table runner is wonderful and what a good pick-up to the dishes. I like the idea of the charger material reminding you of the nest building. That's how my mind works on these things too! The runner and dishes are perfect together! I'm building my collection of square dishes and I love them. Beautiful table! Rosie, this is just beautiful! I love the square toile plates. I recently bought some plain white square plates. I think they're fun to use! I think you were wise to get the pitcher and platter, too ;) !! 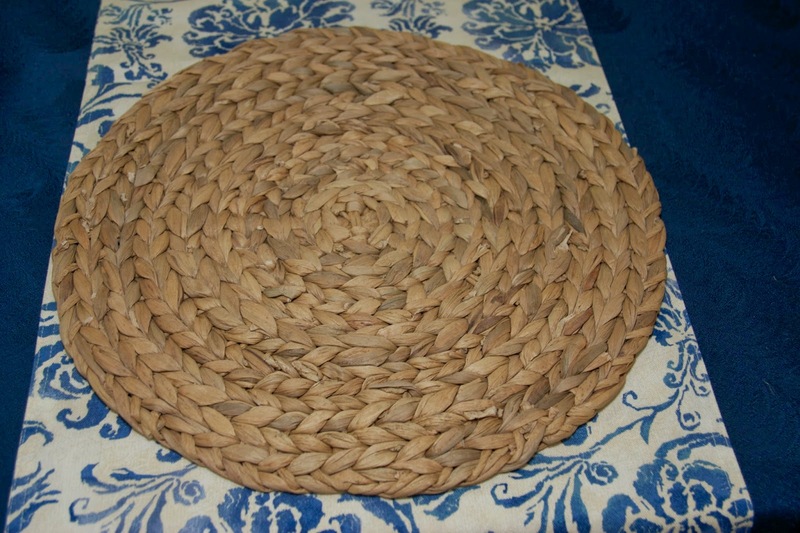 the burlap and the woven chargers are a perfect touch for nest-building season. Wise and wonderful choice for your foray into the world of square dishes!!! I love the design and the color!!! You'll be able to mix and match these for years to come. I don't think square will really go out of fashion. It will quiet down, but it won't ever completely go away. I love all the layering you did on the table! Very nice!!!! Have a great weekend! Perfect centerpiece choice. I want some square dishes now. Very pretty. So lovely! Love that new china of yours...and all the other pieces as well. Gorgeous, gorgeous, gorgeous, Rosie! There is nothing quite like ushering in spring with blue, white and yellow. I love the salad plates. Gorgeous setting!! May I borrow the Ralph Lauren runner? :)) I am an ardent Ralph enthusiast! Everything came together very nicely. I was like you with regards to square dishes...now I am obsessed with both. I love the square because of the way they showcase certain chargers and placemats as well as food. Rosie, this is beautiful. I almost could not take my eyes off the bird pitcher in the centerpiece to enjoy the rest of the table. However, I did manage to finally tear myself away and the rest of the table is just as charming. 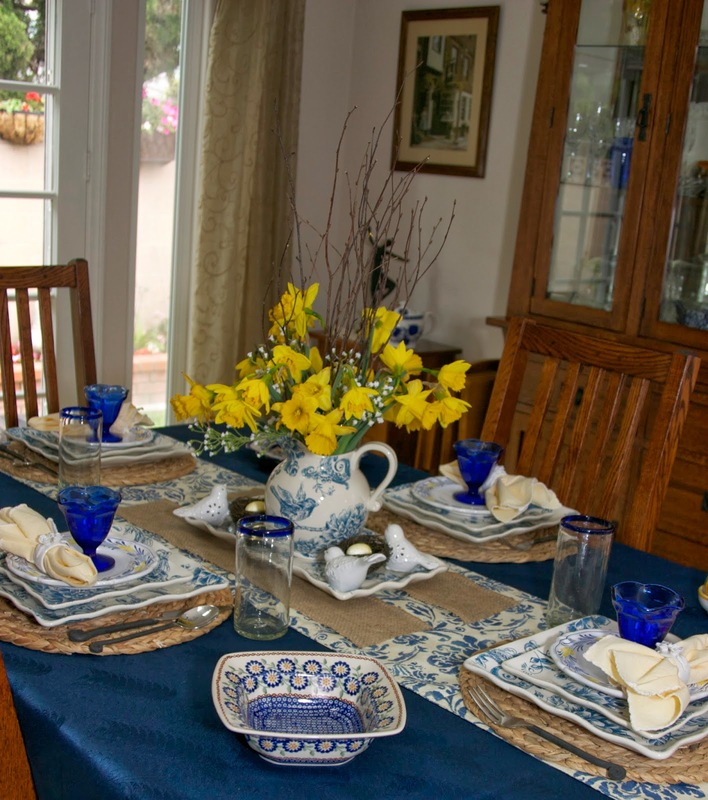 The blue and yellow color scheme is so warm and inviting and what could be lovelier, than daffodils??? Square dishes are one of those things that throw people off. I have a few now and like them. 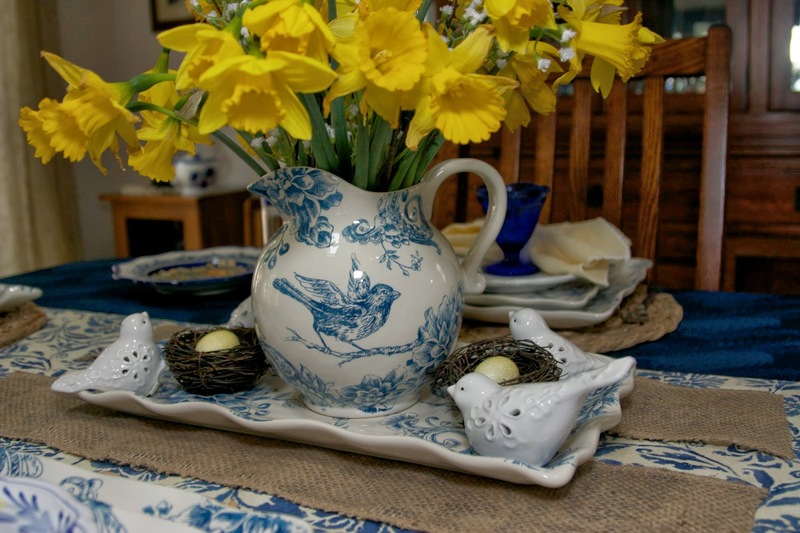 Those are pretty dishes- and the centerpiece with the daffodils and little birds is cute! What wonderful dishes, I am amazed at how many "bird" dishes there are out there. Your table is just beautiful and so Springy! Thank you for taking part in the challenge! Very nice, Rosie. 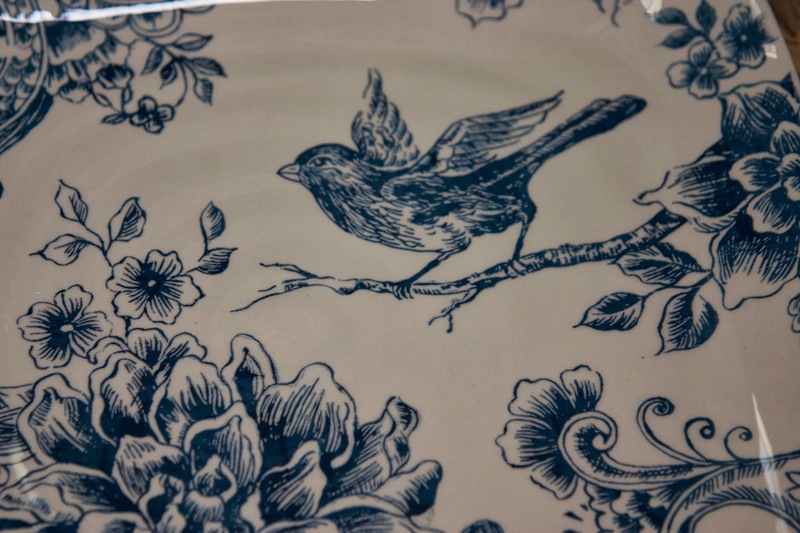 Those blue and white dishes with the bird design are so pretty! Your whole table makes my heart sing. 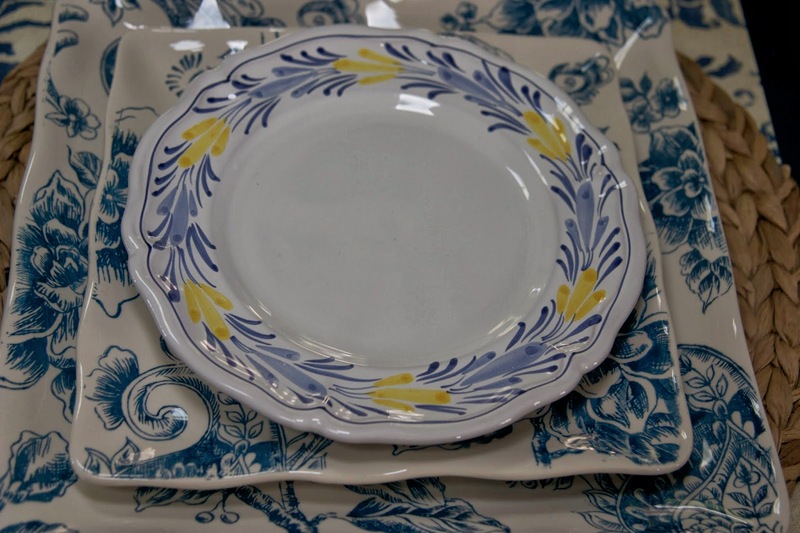 I think you will enjoy the square plates and with blue and white you can't get any better. I love your pop of yellow with the beautiful daffodils. The deep blue sherbet dishes are divine. Such a lovely table I may have to make the leap to trying some square plates myself. Beautiful centerpiece. Love all of that blue and white! I do hope you'll share this at Seasonal Sundays. Beautiful stack of dishes. Love the toile pieces. 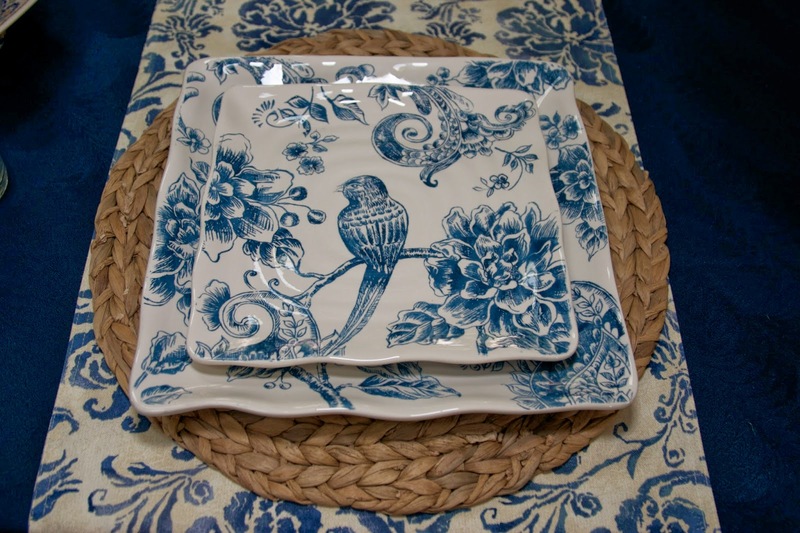 I love your blue and white toile plates from the HG store. 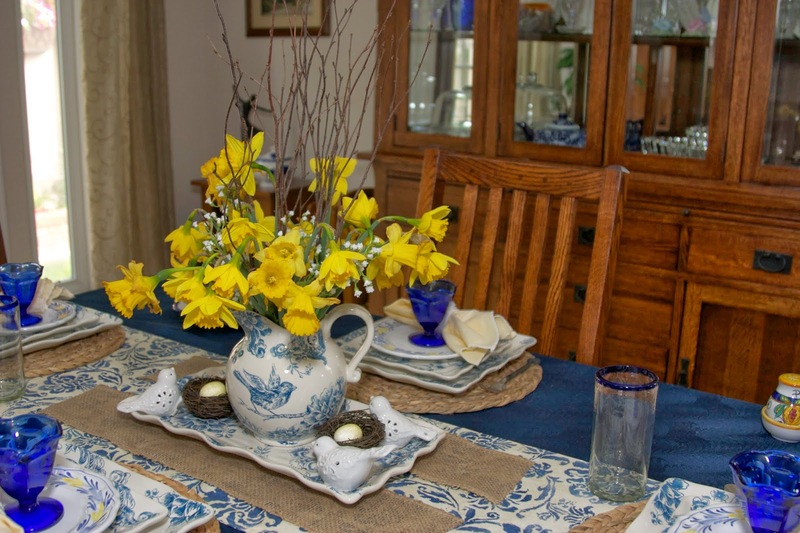 The Ralph Lauren table runner is perfect with the plates and the matching toile pitcher full of daffodils in the centerpiece. Beautiful! You collection of blue and white (with a splash of yellow) all fits together beautifully. Wonderful setting! You are going to have so much fun with those square plates Rosie! They are just gorgeous! My will power always seems to take a vacation when I walk into HG, but I have never regretted one purchase! I love the way you paired these new beauties with the drool worthy Italian round ones~your whole table is just stunning, the RL runner is perfect too!